Yay – it’s time for your weekly Foodie Friday recipe! This week we’re bringing you the only salad dressing recipe you will ever need for scrumptious healthy salads every day. When it comes to salad, we all know it’s all about the dressing! But as we’ve discussed before, many store-bought dressings come with nasty or just plain unhealthy ingredients. Luckily, it’s super easy to make your own! With the right ratio of oil to acid, and your own choice of seasonings, you can whip up a truly stand-out dressing in just minutes. 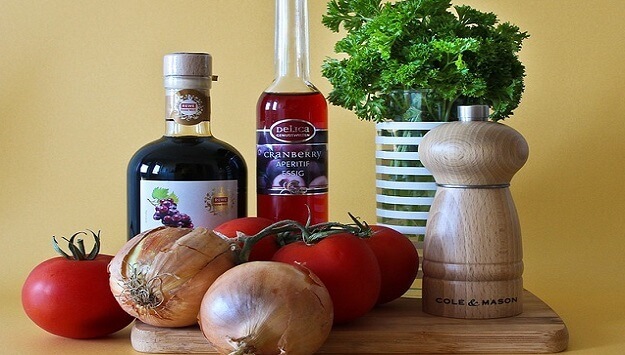 No matter what vinaigrette you’re making, stick to a ratio of 1 part vinegar to 3 parts oil. If you prefer a tangier dressing, up the ratio to 1:2. Though we’re specifically talking about vinaigrette here, the same ratio will work with any acid—lemon juice is particularly nice. Those two basics are really all you need. To combine two things that don’t naturally mix—in this case, oil and vinegar—you need to create an emulsion. To do it, combine the two star ingredients in a small bowl, and whisk, whisk, whisk until your vinaigrette appears thick and creamy. Or seal it in a glass jar and shake vigorously…. No matter how well you mix, however, the two will eventually separate. That’s where emulsifiers known as surfectants come in. Surfectants—mustard, honey, mayonnaise, and egg yolks all work…, helping to marry the two into a homogeneous vinaigrette…..
…As long as you stick to the standard ratio, you can add anything you want: think spices, fresh herbs, jam, chopped nuts, and more. …Get started with these five classic combinations….